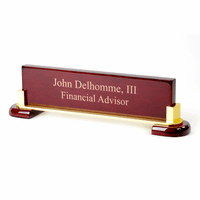 FEATURES/SPECS This custom engraved red alder wood desk wedge is elegantly simple. 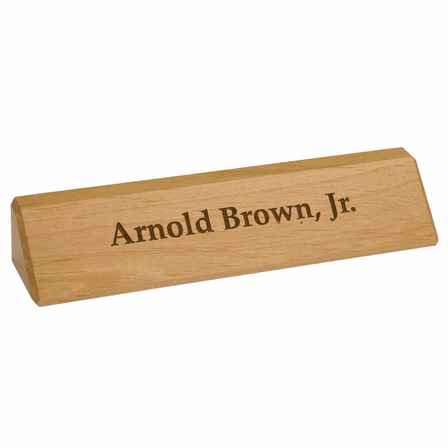 It is made of one solid piece of red alder wood that you can have laser engraved with the personalization of your choice. 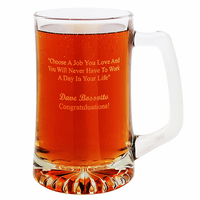 A popular choice for personalization is the recipients name with their job title below it. 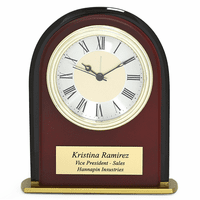 The engraving is free of charge, perfect for gift giving on a tight budget! 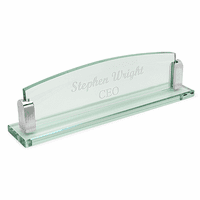 This personalized desk wedge comes packaged in a gift box and ships out the day after you place your order. Sure, we could do that. Just let us know in the comments section what you would like engraved on the bottom of the desk wedge. The nameplate was exactly as described.,And we love it. But I wanted to point out that when ordering I had left the message area blank by mistake. Did not realize this until I got an email from executive gift shoppe, double checking to see if I actually wanted a blank nameplate. Very helpful and considerate. Would by from them again for sure. Item was exactly as described. Perfect gift item. Shipped really fast! It was a great gift and was proud to give it. It was a great gift and was proud to give it. Made very well, great price and was delivered fast. Thank you! Very satisfied with this red alder desk sign. It was made of a high quality piece of red alder - nice grain pattern, no defects at all, and the laser engraving was crisp and clean. The block of wood was dense and substantial feeling. All corners were nicely chamfered. This was a gift for a friend who was recently promoted to a new position, and she loved it. My only small suggestion would be to include some felt or silicone rubber pads for the bottom of the sign. Without pads this will easily slide on a glass or polished desk top. ProsBeautiful, deep, high-resolution laser engraving. Substantial size and weight, good quality wood. Looks "Professional"
ConsSignificant "burnt wood" smell form laser engraving. Not an issue for me or my gift recipient, but might be an issue for some. I suspect that this will slowly dissipate over time. Perfect order in record time! I had never used this company and rarely shop online, but I wanted a personalized desk item for my boss. I chose the item in my price range, noted the script for it, and paid, hoping that it looked appropriate for his office and arrived within the month. It was so much nicer than I expected, was perfectly worded, and arrived within a week. I was so pleased. What a great company! Love the fast shipping, and add on features. Great products also will be ordering many more in the future! The desk sign we ordered is perfect. The website was easy to navigate, the process smooth. The item arrived quickly (for free! ).